Floods are the most common and costly natural disaster in the nation and cause millions of dollars in damage every year. Floods cost America, on average, $8.2 billion each year. However, most homeowners and renters insurance policies do not cover flood damage. If you live in a high risk flood area, you may already know that often, mortgages will require you to have flood insurance. But if you don’t live in a flood zone, you’re probably wondering why you need flood insurance. The fact is floods can happen anywhere. More than 20 percent of flood claims come from properties outside the high-risk flood zone. In Texas, after Hurricane Harvey, almost half of the damaged homes were outside the flood risk zone. However, if you don’t live in a flood-risk zone, that does not mean you are not at risk of flooding! 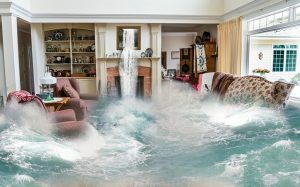 For insurance purposes, a floor is defined as any water damage which affects you and at least one other neighboring property. Homeowner’s and renter’s insurance policies do not typically cover flood damage. This leaves a big possibility that your valuables and your home may get damaged or ruined, forcing you to pay out of pocket for any repairs or replacements. Recovering from just one inch of water inside your building can cost about $27,000. Hazards include everything from flash floods to your neighbors swimming pool overflowing. And being outside of the flood plain makes flood insurance very affordable. For example, if your house is located outside of a flood zone and is worth around $150,000, your flood insurance would probably be under $300. This isn’t only for residential properties either. Commercial buildings are also affected and can suffer serious damage. That means, essentially all policies are the same, the only difference is the coverage amount. Again, if you live outside a flood zone, your flood insurance can be inexpensive, so why not at least consider it? Floods are costly, and not only to a home or business, but to the personal property inside. Don’t risk the damage to your property and your wallet. Contact Chastain Otis and we will get you the coverage you need at a price you can afford with our local independent insurance agents in Omaha.